This group of a mother and child in Oriental costume playing with a kitten is perhaps the finest of Joseph Willems early works at Chelsea. Only one other example is known, an undecorated group in the Museum of Fine Arts, Boston. In both groups, the child and attentive mother are holding the short handle of a diabolo or Chinese Yo-yo, a type of spinning top suspended on a fine cord, with which they tease the kitten lying prostrate on the ground at their feet. The engraving itself is not dated, but the set was used for the Tenture Chinoise tapestries made by the Beauvais factory in 1744, and shortly thereafter inspired production at the Vincennes porcelain factory. While the rosy cheeked mother is almost directly after the print with her top-knot bound coiffure and voluminous robes, the small ruddy-faced boy with four black-painted tufts on his shaved head is the sculptor’s own clever invention. Willems captures the toddler struggling to maintain his balance, actively engaged in the game and delighting at the cat’s annoyance. 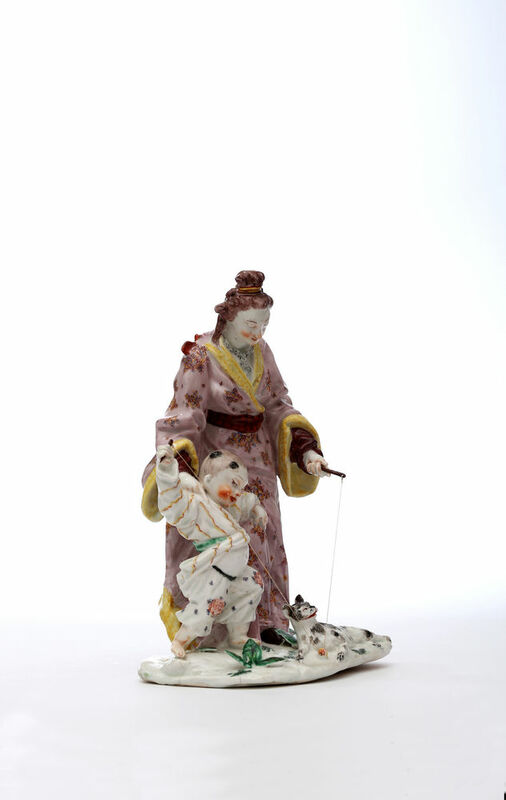 Another significant variation is the implements used in the game, in the print only the mother holds a long baton, suggesting that it is a different toy. The apparently unique pendant to this model is a polychrome Chelsea chinoiserie group with raised anchor marks made in two parts, one a mother and child, and the other a single kneeling child: both are in the Museum of Fine Arts, Boston, acc. nos. 30.328 and 30.323. This two-part model is closely based on another print from the same series after Boucher, ‘Les Délices de l’enfance‘, engraved by Jean Joseph Balechou (1716–1764). Both porcelain groups appear to be painted by the same hand or at least from the same workshop. 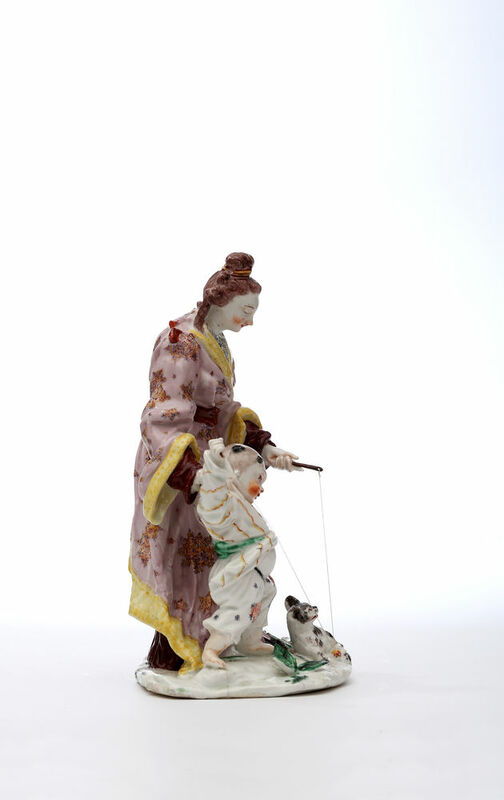 These chinoiserie groups are highly important in the history of the development of porcelain sculpture at Chelsea. 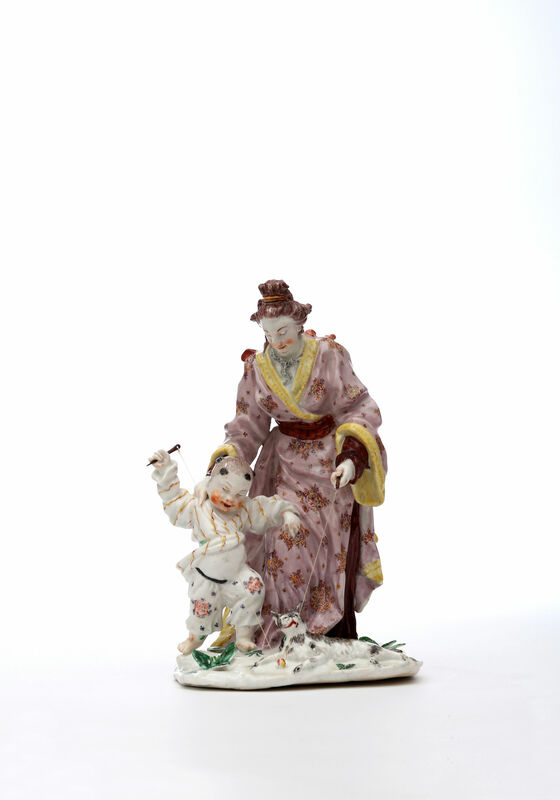 From the late 1740s, Meissen porcelain figures were increasingly appearing on the London market. Until then, the Chelsea factory had only produced a handful of figures, some probably modelled by Nicholas Sprimont, the Paris-trained Liègeois silversmith and proprietor of the Chelsea factory. Arthur Lane, who described these chinoiseries figures as “highly impressive” identified them as the work of Joseph Willems, a sculptor who had arrived from Tournai in 17484. Chelsea desperately needed to be at the forefront of European design and establish their own distinct style to compete with Meissen. Clearly, by December 1750, when an auction advertised ‘Curious Dresden and Chelsea figures’ for sale, they were making great strides. 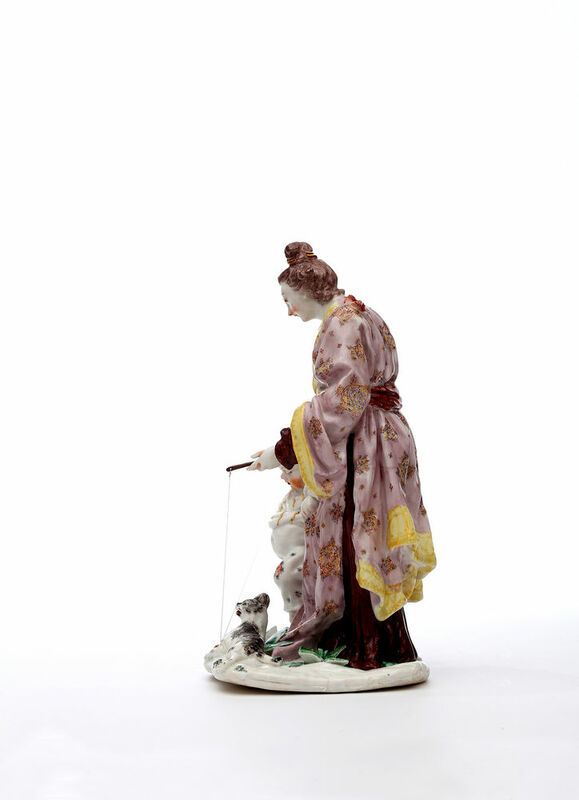 Significantly, in this early period, Chelsea’s finest figures were not slavish copies of Meissen models, but original sculpture translated from a variety of engraved sources, many after Boucher. Where and how Sprimont and Willems procured these fashionable prints is not known, however, many were engraved by the Parisian Simon François Ravenet (1706-1774), who emigrated to London around 1750. 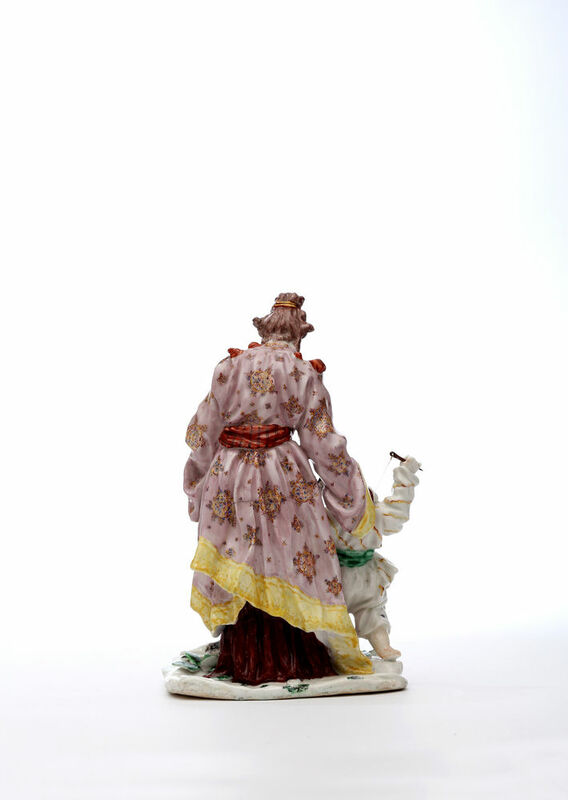 Coincidentally, the Meissen factory produced several models after the same print source a year or two earlier. The aesthetics are completely different. While the German groups are more polished, they lack the verve and originality of the Chelsea groups, where one can almost feel Willems’s creative genius at work, as he transcribes the two-dimensional printed image into three-dimensional clay. A white example, Raised Anchor period, about 1750-2, the Jesse and Sigmund Katz Collection, Museum of Fine Arts, Boston, 1988.804. 23.5 x 15 x 12 cm. Literature: Arthur Lane, ‘Chelsea Porcelain Figures and the Modeller Joseph Willems’, The Connoisseur, May 1960, fig. 11, where it is dated 1751-2. Condition – The base broken into several sections with associated firing cracks. The mother broken through the knees, neck and hands, one finger missing. The boy intact but detached. Some of this happened in the firing and there is evidence of original factory repairs. The only missing pieces are: one finger missing on the mother, both playing sticks. Six tips of leaves missing and cat’s ears chipped. The raised anchor mark at the rear has been partially fractured due to a kiln flaw, which occurred during firing. Some extensive damage with original factory repairs. Lucius O’Callaghan (1877-1954), R.H.A., F.R.I.A.I., Dublin, an Irish architect, and former Director of the National Gallery of Ireland, acquired c. 1939. Exhibitions – London, 1954: Masterpieces of British Art and Craftsmanship, Ormeley Lodge, 1954, no. 20. London, 1968: B.A.D.A. Jubilee exhibition, Victoria and Albert Museum, no. 98. Literature – 1. Pierrette Jean-Richard, L’Œeuvre gravé de François Boucher dans la Collection Edmond de Rothschild, Paris: 1978, no. 199. 2. See the copy in the Cynthia Cary Art Collection, Redwood Library, Newport, Rhode Island. 4. For a study of these early figures see Arthur Lane, ‘Chelsea Porcelain Figures and the Modeller Joseph Willems’, The Connoisseur, CVL, June 1960, pp. 245-251. Bellamy Gardner, ‘An Early Chelsea group with raised anchor, Apollo, XXIX, January 1939, pp. 32-4, Fig. 1, where the polychrome group is illustrated alongside its pendant group, now in the MFA, Boston.